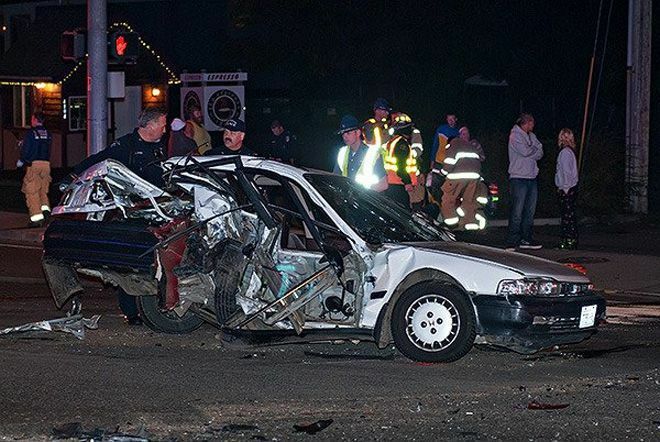 According to Bremerton Police Chief Steven Strachan, five people were injured in a car accident involving five vehicles on Friday night. The accident occurred at the Kitsap Way-National Avenue intersection. The pile-up began when a woman driving “at a very high rate of speed” came down a hill and struck another car, pushing it into traffic, where it struck two more vehicles passing through the intersection. The car that caused the accident then struck a fifth car and rolled over. One man was critically injured in the crash. He was extricated from his car and flown to Harborview Medical Center in Seattle. Four others with injuries were taken to Harrison Medical Center in Bremerton, two women with serious injuries and two children with non-emergency injuries. Police have stated that speed was “clearly a factor in the crash.” The woman who caused the accident has told police that she believes that she fell asleep at the wheel. The man who was flown to Harborview, Gian King, died from his injuries on Sunday. Police will continue to investigate the driver who caused the pile-up and the facts of the accident. When the investigation is complete, the Kitsap County Prosecutor’s office will decide whether criminal charges will be filed. The driver responsible for the accident may also be liable for civil penalties, including Mr. King’s medical expenses before his death and damages from the other injured victims. Mr. King’s family has set up a memorial fund to help pay for his burial, medical bills, and other expenses.